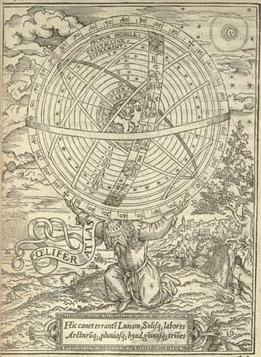 Illustration from William Cuningham's The Cosmographical Glasse (1559) represents Ptolemy's conception of the universe. While very few creationist hold to a strict geocentric view, galactocentricity has received acceptance by many and even established and prominent creation scientists. Evidence, such as quantized redshift, has been offered as strong support that the Milky Way exists at the center of the universe. Historically, geocentrism has been accompanied by belief in geostationarity, that the Earth is absolutely stationary, and belief that all other celestial bodies revolve around the Earth, as in Ptolemaic astronomy. Some modern-day geocentrists uphold a modified version of Tycho Brahe's model of the solar system where the sun is orbiting the earth. 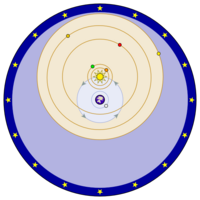 Modern physicists sometimes refer to the geocentric perspective as Machian, after the famous physicist Ernst Mach who denied the existence of absolute motion and space and thus maintained that geocentrism and heliocentrism were equivalent. The idea of geocentrism was thought abandoned when the majority of scientists gave support for the heliocentric model, which states that our planet is part of a solar system that is itself part of a larger galaxy. However, Einstein's relativity theory asserts that the frame of reference for observing motion is arbitrary. Since all observed movement can be considered relative, this debate may be more philosophical and metaphysical than scientific. Mainstream creationists agree that the the Earth is in motion around the Sun, and our solar system is as well in movement within the Milky Way galaxy. However, simply put, galactocentricity is the belief in a galaxy centered theoretical framework to interpret the universe and has gained some traction with prominent creation scientists. Evidence such as quantized redshift offer strong support that the Milky Way exists at the center of the universe. Tycho Brahe's geocentric system (late 1500s). The Moon, Sun, and stars all revolved around the Earth, but unlike the previous models, he had the rest of the planets revolving around the Sun. Most of the scientific establishment have argued against geocentricity by saying that the Earth indeed does move around the Sun and is not always at a stationed point in the center of the universe. Geocentrists which are not necessarily creationists as some in the modern evolutionary establishment seem to think, hold essentially two different perspectives. On the one side they insist, and rightly so to a degree that human knowledge of the universe is insufficient to completely rule-out a geocentric positioning within. And if indeed the universe was created to be viewed from earth it would seem the implication is that it is at the relative center. The other camp takes a bit more extreme approach some would say as they hold to a belief that the universe revolves around the earth, and thus it causes the necessary movement required to make day/night and seasonal patterns. These geocentric theories state that the force and mass of the universe causes effects on the earth such as the coriolis effect. These geocentrists place the earth at the primary centre of such movement in such a way that the sun revolves round a stationary earth, and the planets revolve around the sun. In such a system, the earth is not viewed as a planet, since the word implies a moving object. Both camps admit that no experiment, observation, or phenomenon can demonstrate that the earth is moving. Relative motion appears to exist between the earth and the other bodies in the universe, and that is all that any measurement can ever prove. The measurements will remain the same whether the universe turns around the earth, or the earth rotates and orbits around the sun. From our point of view, all motion is relative and trying to say which is really moving without reference to an objective point of view, is pointless. Copernicus and Tycho Brahe simply chose different coordinate systems for their models. Having properly defined the word in use, it is clear the passages are simply saying that the earth's place has been fixed or secured by God through natural gravitational laws so it cannot be altered to a severe degree. It is important to note that many geocentrists believe in a non-orbiting and non-moving earth, not just a universe-centered earth. Several pieces of evidence have been introduced to challenge this view. Foucault's pendulum demonstrates the rotation of the earth; without such rotation there is no reason for the pendulum to rotate its plane of swing. A non-rotating earth would require the outer planets and the stars to be moving at excessive (translight?) speeds. Measurements of relative motion between the earth and the nearer planets indicate that the other planets are not moving fast enough for the earth to be stationary. Differences in escape velocity at the poles vs the equator wouldn't exist on a non-rotating planet. Similarly, satellites in geostationary orbit would be motionless over a non-rotating planet, and would simply fall down. The Coriolis effect would not exist on a stationary earth. Earthquakes, including those induced by placing explosives in geological fault-lines, can produce measurable changes in the earth's rotation. If the earth is in fact stationary, this would mean that events on earth can instantaneously affect the motions of stars many many light-years away. The orbit of the earth around the sun is used as a baseline for measuring distance to stars using the parallax method - if the earth was stationary this ought not to be possible. The relative frequency of shooting stars before/after midnight indicates that the earth is both rotating and moving through space. The red shift measured in stars' spectra changes in an annual cycle; if the earth is not circling the sun, then stars must be constantly accelerating/decelerating in something akin to a 'Mexican wave'. Catholics Apologetics International - containing lots of answers about geocentricity. Geocentricity: A Fable for Educated Man? - Gerardus Bouw's critique of Danny Faulkner's review of Bouw's book. About scientific (& theological) aspects of Geocentricity - A lengthy article giving geocentric answers to many helio-centric questions including the coriolis effect, parallax, satellites, and Foucault's pendulum. This page was last modified on 13 July 2011, at 10:52.